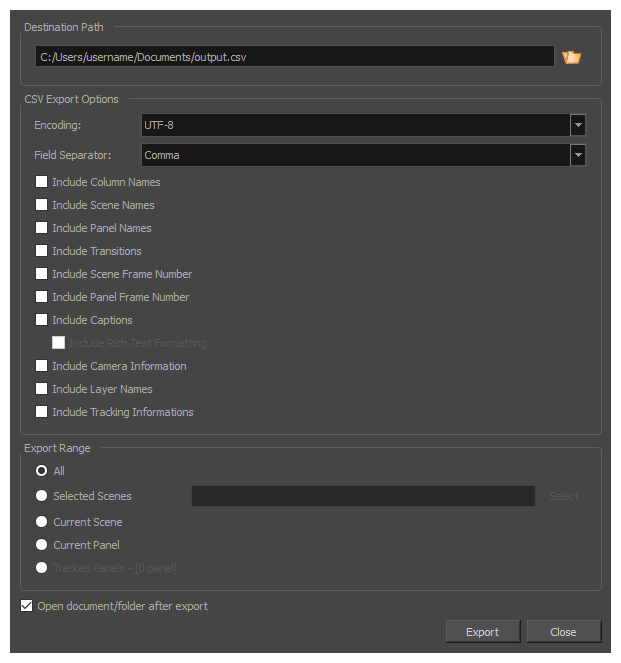 You can export the metadata of your storyboard, such as the names of scenes, panels and layers, transitions, captions and camera information into a Comma Separated Value (.csv) format table. You can then view and edit the Comma Separated Value (.csv) file in any standard spreadsheet editor, such as Microsoft Excel, OpenOffice Calc or Google Sheets. This can be useful if you need to analyze any specific aspect of your project. If you export your project's captions, you can also edit them, then import the edited .csv file back into Storyboard Pro to update your project's captions. This can be useful if you want to review and edit your storyboard's captions in bulk using a more lightweight interface. In the Save dialog, browse to the location in which you want to export your CSV file. In the File name field, type in the desired name for the document and click on Save. In the Encoding drop-down, select the type of text encoding for the CSV file. Choosing the right encoding might be necessary depending on what kind of encoding the editor you plan to use supports, and whether it needs a specific kind of encoding for Unicode characters. In most cases, UTF-8 should do the job. In the Field Separator drop-down, select the character to use for separating each cell in the table. Generally, CSV editors expect the field separator to be commas. Otherwise, you can choose between the following characters: Comma, Semicolon, Tab or Vertical bar (pipe). Check each type of data that you want to include in the exported table. The exported .csv file will contain one row for each exported panel. It will also have at least one column, the Object Id column, which stores a special identifier composed of 16 hexadecimal characters for each panel in your storyboard, making sure that Storyboard Pro can identify which row belongs to which panel in your project. Include Column Names: Adds an extra header row at the top which indicates the purpose of each column in the table. Include Sequence Names: Adds a Sequence column which indicates the number of the sequence for each panel. Include Scene Names: Adds a Scene column which indicates the number or name of each scene for each panel. Include Panel Names: Adds a Panel column which indicates the number or name of each panel. Include Transitions: Adds a column for each transition in the project, between the rows corresponding to the two panels that are joined by the transition. Include Scene Frame Number: Adds a column that indicates the length of the scene in frames. Include Panel Frame Number: Adds a column that indicates the length of the panel in frames. Include Captions: Adds a column for each caption type in your project, and which will indicate the content of each caption type for each panel. Include Rich Text Formatting: If your captions have any formatting, check this option to export the content of your captions in HTML, which will preserve the formatting of your captions. If this option is unchecked, your captions will be exported in plain text. They will be easier to read and edit, but if you re-import the .csv file into your project, the formatting of the captions will be lost. Include Camera Information: Indicates whether the camera is static or dynamic (animated) for each panel. Include Layer Names: This will add as many columns as the amount of layers in the panel that has the most layers. For each panel, the name of each layer in the panel will be indicated. Layers at the bottom are listed in the leftmost layer column, and layers at the top are listed in the rightmost layer column. Include Tracking Information: Indicates whether or not the panel is tracked, the date at which the panel started getting tracked, and the tracking notes added to that panel, if any. To view the exported file in your machine's spreadsheet editor after the export, enable the Open document/folder after export option.